The Interactive Map is a side project of Audio Crumbs and was created at the same time during the Hive#2 Residency at thecamp. 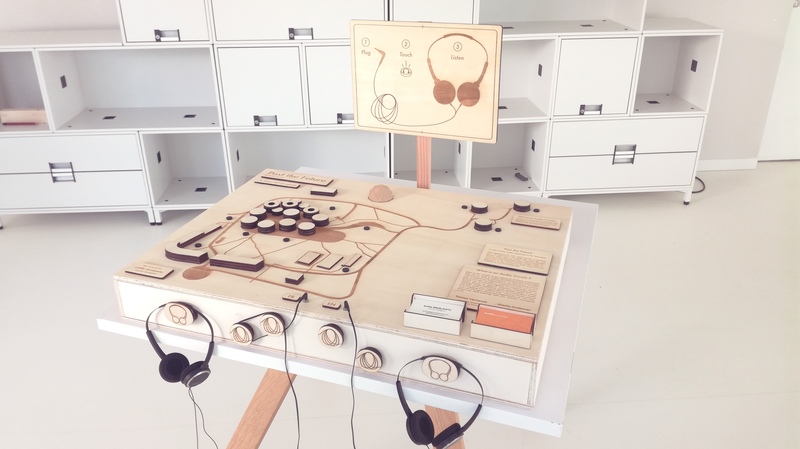 Its first purpose is to present the Audio Crumbs experience named “Past the Future” to the visitors of thecamp and give them a glimpse of what the next experiences of Audio Crumbs that have not been designed yet could look like. 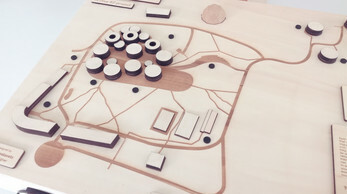 It’s a plywood box representing on its top side a three dimensional map of thecamp on which are placed touch sensitive buttons. 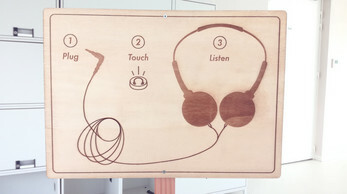 By touching them, the user launch an audio recording translated in two languages, French and English. The user can hear them by plugging headphones or audio speakers on the two respective jacks placed on the box. The all mechanism is located inside the box and includes two electronic boards connected both to two audio jacks and to the ten buttons that were specifically designed for this object. The technology used to build this map is the Touch Board and Electric Paint from Bare Conductive.